The winter felt incredibly long this year in Germany. Around Christmas time I had decided the only way to cure the lack of Vitamin D blues was to book a beach holiday. The first weekend I thought would be worth visiting a beach area was Memorial Day weekend – which also happens to collide with my birthday. Double reason to head away! I booked our tickets on Boxing Day (the day after Christmas) and set to planning the trip during the rest of the long, dark winter. Flights were expensive, even with Ryan Air, because unbeknownst to me, the 25th was also a holiday in Germany. Mallorca, an island off the coast of Spain in the Mediterranean sea, is a popular destination for both Continental Europeans and Britons. We left late on Friday night, after we had both finished our working day and arrived in Mallorca at around 2100. 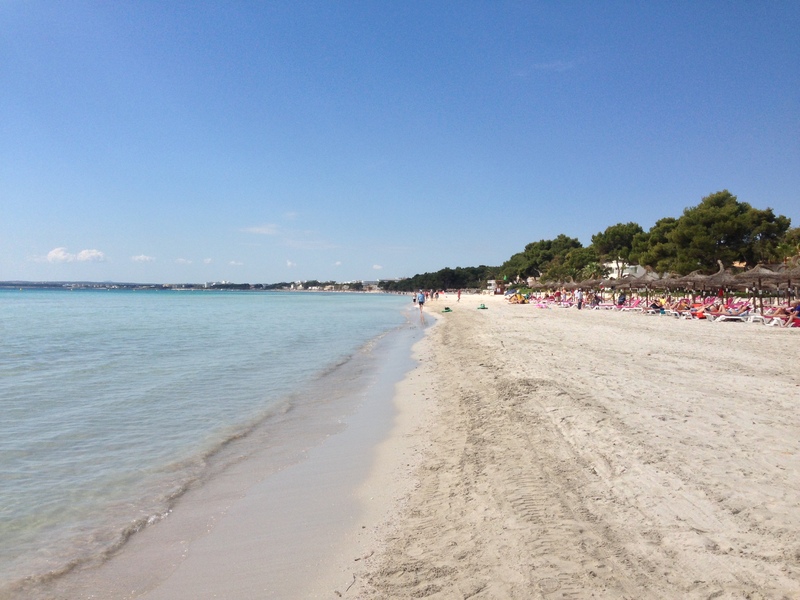 I did a bit of research and discovered that Alcudia, on the north east side of the island, was a better spot for relaxation than the areas nearer to Palma – where the airport is and where the cruise ships dock every day. However, it was an hour from the airport. The hotel we stayed at booked us a shuttle, which turned into a disaster. I won’t write in detail, but we didn’t end up at our hotel until 0130! Never, I repeat never, take a shuttle bus to Alcudia unless you know that you will be one of the last to board the bus. The shuttle doesn’t leave until it is full. It was a full size city bus. We were the first on. We awoke rather grumpy after our delay the night before, but it was a beautiful day out and the sun was beautiful. Our hotel was the Astoria Playa – an adults only resort that had half board included. 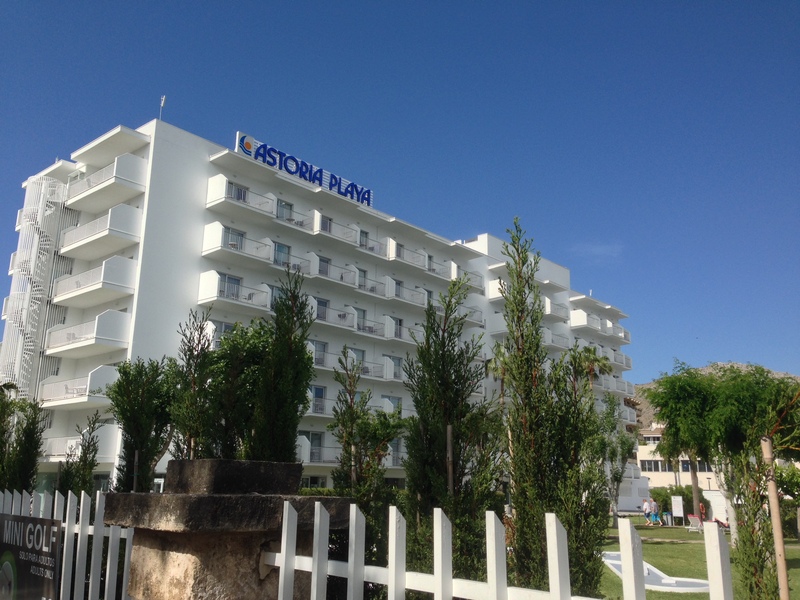 At around $100 a night it was a great deal and it was the top rated hotel in Port d’Alcudia. Breakfast was delicious, plentiful and there were lots of new foods to try. We didn’t have many set plans for our trip, other than relaxation, so we decided to walk down to the beach to see what it was like. There was an international beach volleyball tournament on that took up the first part of the beach near our hotel, which was unexpected! However, the beach stretched for miles down the coast and every part of it was beautiful – crystal clear, shallow water and beautiful white sand. After our extravagant walk (just kidding, it was about five minutes away) it was time to relax by the pool. We had been dieting for months and wanted to actually make sure we hadn’t done that for no reason! The pool area by the hotel had a bar with servers that came around, so it wasn’t long before sangria was ordered. A wee tip if anyone stays at this hotel – the square pool bar is cheaper than the other pool bar! Our huge sangrias were 4.50 each at the square pool, but 7.50 at the other pool. The area was extremely relaxing with ‘chill out’ music until 1200 which changed to more party/modern music after. We had no trouble getting a pool lounge chair at any time. There was a Pizza Hut next door to our hotel, so we hopped next door for a slice of pizza each for lunch to tide us over. We were able to eat it by the pool with no one telling us that we couldn’t bring our own food in. The same for drinks – we had our own water and even soda occasionally and we were fine. I’m not sure if it was because we also bought drinks – but either way, there were no issues. The drinks were billed to our room so no need to carry cash around. Dinner was also a buffet style. Men had to wear trousers, women were not required to cover their legs but I noticed many did anyway. There was a wide variety of food each night with a lot of variation. While it was nice not to have to worry about buying dinner each night, I don’t think we would do half board again as there are a lot of restaurants I think we would have liked to try. We were awoken from our slumber to the cleaning ladies. I think they started at around 0700, so as always, our earplugs came into play after the second night. After breakfast we decided just to head straight back to the pool again for day two, but not before we booked a horse ride for later that afternoon. We did hold out until 1200 for our first sangria by the pool. 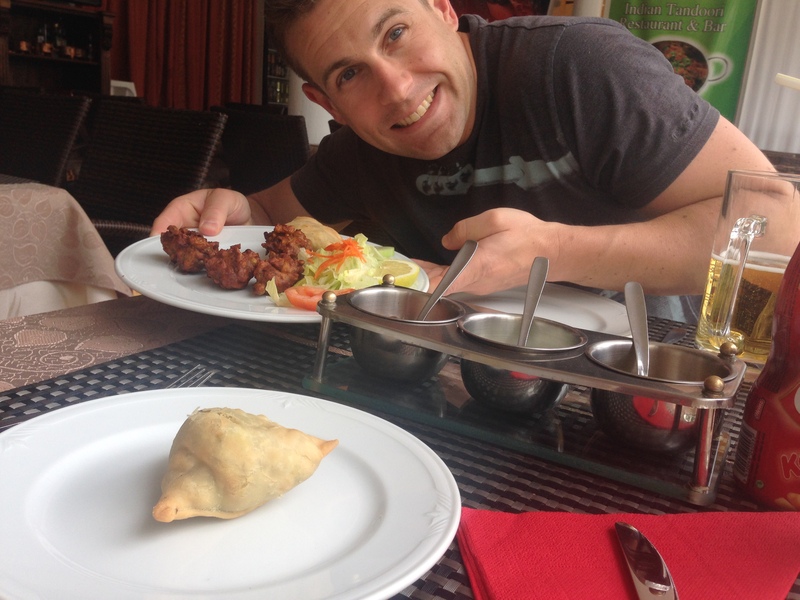 At around 1400 our bellies started protesting against the alcohol only lunch, so we walked off to find the Indian restaurant that was on a brochure that I found in the hotel lobby. Maharaj restaurant ended up being the best Indian food we have had outside of New Zealand! What were the odds?! They had a special where for 12,99 you got a starter, a main curry and sides. The meal was extremely filling and delicious. The setting was beside the canal which made it a nice setting to eat at. On the walk back to the hotel we passed by one of those fish foot-eating places. I don’t know how else to describe it, but I knew I had read an article once about how they were unhygienic and thus banned in many countries now. The courage brought on by the sangria meant that we ended up going in based on the advertising that said that it would feel like ‘1000 kisses’. Who could pass that up? For the next 20 minutes we ended up having little fish eat the dead skin off our feet. It actually did feel nice and we were given a glass of sparking wine to calm the nerves. After an afternoon nap to help the sangria wear off, it was time to go horse riding! We were picked up from the hotel at around 1700 and driven off to a farm. It turned out it was only about a kilometer from our hotel – which was a bit awkward, we could have walked easily, but there’s no way we could have known that it would be that close by. We rode for an hour along paths that winded past hotels and a highway. It was a bit different, but I loved my horse – called Kansas – and it made me want to ride again. One day! We were back in time for the buffet dinner again, which was good again. We got to listen to the nighttime entertainment from our balcony as we watched the sun go down. This was the most disappointing day. As I mentioned earlier, I didn’t realize it was a holiday in both Britain and Germany when I booked this trip. I booked our only tour on a Monday, thinking it would be quiet and a small group. 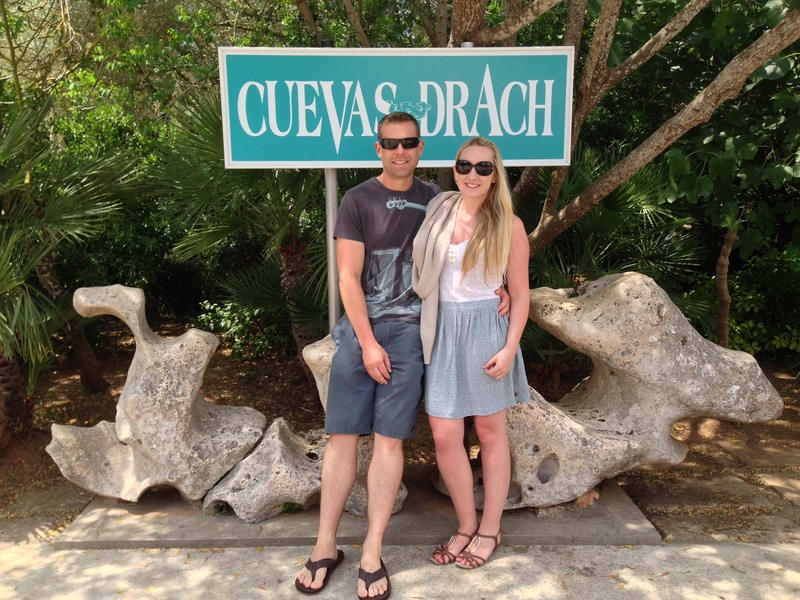 It was a tour to the Caves of Drach – ancient caves stretching 2.5km, first mentioned in the 1300s. Things went wrong as soon as a double decker bus turned up. Apparently the only bus of it’s size on the island, and the full bus and everyone on board was taking the same tour. That is 100 people. About 80 adults and at least 20 children. It was a long enough day for adults, let alone the little ones who wouldn’t have time for a nap. 100 people getting on and off the bus several times. And at least one of us had a hangover. Children screaming definitely wasn’t going to make my day. The first stop was a pearl factory, which turns out they weren’t actually pearls at all. The tour involved watching a lady make fake pearls out of glass and then free time to buy fake pearls. I’ll pass, thanks! We ended up sitting outside and enjoying a nice cold diet coke while we waited for everyone else to be done inside. The second stop was a stop at the lighthouse – cue all 100 people getting out and back on the bus after a short amount of time. It was a pretty location and it would have been nice to spend some time there if we were in a smaller group. The stop we had booked the tour for was next. The Caves of Drach. The caves were absolutely breathtaking. After walking down the path deep into the earth, everyone was funneled into a small seated area which was almost pitch black that looked out over the beautiful underground lake. After awhile, everyone was silenced in about ten different languages and a lit up boat appeared, carrying an orchestra. They played music in their boat, on the underground lake, for about ten or so minutes. It was beautiful and eerie at the same time. Eventually everyone seated were able to line up to get in a boat and be carried across the underground lake. It was quite humid in the caves and I was lucky enough to be sitting on the side of the boat, so I could feel the warmth of the lake’s water. I would absolutely recommend going if anyone reading this travels to Mallorca – just rent a car and do it yourself. After the Caves of Drach we were dropped at Porto Cristo for lunch. After Nick’s temper flared (rightly so) at a café owner, we found ourselves a quiet restaurant for lunch. We ended up enjoying some tapas and sangria (to be able to handle the bus ride back) before heading to the beach for some quiet and relaxation. The beach there was beautiful! I would definitely go back there, as the town was quite cute and quaint also. I’m not sure how the double decker bus fit through there! Last stop of the day was to a liquor producer. It was unlimited taste tests and I noticed quite a lot of the parents on board getting the full value out of it! I got to my seventh try before I couldn’t stomach any more of the sweetness. They were quiet delicious though and I saw a lot of the people on our bus carrying back plenty with them. Disaster struck. As we were all set to leave, the bus broke down. The only double decker on Mallorca broke down. Nick got out there and tried to help out but it took several bus drivers and quite some time before we were actually able to leave. It felt like the longest day on earth and has put me off booking tours without seeing the words ‘small group’ anywhere. Thankfully, we had our quiet, adults only resort to head back to for dinner and another night of people watching from the balcony. It was a special day on Tuesday. I was turning the grand old age of 27 in Mallorca. It was up to me how we were going to spend the day. I had originally planned that we would rent a car and head to Palma for the day – that way I could have Hard Rock Café for my birthday dinner. The morning was beautiful. Over breakfast I relayed the news. It was my birthday, and after the day before all I wanted to do was sit by the pool again and drink sangria. So that we did. Lunch was at Maharaj’s again, with a litre of sangria at the side this time. It was once again, extremely delicious. I’m not sure what our waiter friend put in the sangria but I ended up with obnoxious hiccups on the walk back to our hotel, much to Nick’s embarrassment! He kept telling me to be quiet, but it wasn’t until I was back poolside that they went away. I napped away the afternoon until my dinner of choice was Pizza Hut again. You see, when it all comes down to it, I could be happy for the rest of my life if my diet was simply pizza. I also didn’t want to go to the buffet that night at the hotel, so pizza seemed the best choice. However, I think we got pizza that was 10 hours old already, because I woke up at 0200 thinking I was going to have a repeat of our Vienna trip. Lesson learned: don’t buy pizza that was under a warmer at nine o’clock at night. It was time to leave our oasis. We organized picking up a rental car down the street from our hotel and drive around the island that day so that we didn’t end up having to use the shuttle to go back to the airport. The reception lady at the hotel suggested we drive to the tip of the island, which ended up being beautiful and scary at the same time. There were plenty of sheer cliff drops, but the scenery was gorgeous! 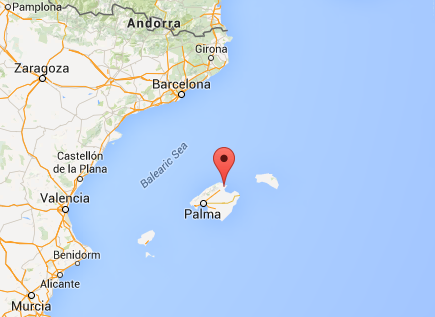 We eventually ended up in Palma, the main city on the island. Lunch was of course, Hard Rock café. It was the best I have had to date! Afterwards we walked around all afternoon, seeing the beautiful Cathedral and ancient city walls. The harbour was full of stunning boats that we ended up looking out at for a couple of hours. There were hundreds of fish right by the dock which was awesome to see. Our flight back to Frankfurt Hahn was at 2100. We ended up at the airport at around 1800, so we had plenty of time to spare. Palma Airport ended up being one of the best airports we have been at in awhile – there were department stores and a huge amount of options for shopping and eating behind security. I would absolutely recommend getting there a couple of hours early to explore it at length. The plane ended up delayed by about half an hour to an hour. We were back at Frankfurt Hahn at around 2330. Getting up at 0600 for work the next morning was a bit rough, but the trip was absolutely worth it!